A tasty south Indian soup, traditionally prepared using tamarind juice as a base, with the addition of tomato, and chili pepper, pepper, cumin and other spices as seasonings. A south Indian stew made from lentils, vegetables, tamarind and spices. A delicious soup made of tomatoes and cream. A delicious soup made with corn and vegetables. A delicious soup made of spicy and tangy combination of veggies and Chinese sauces. 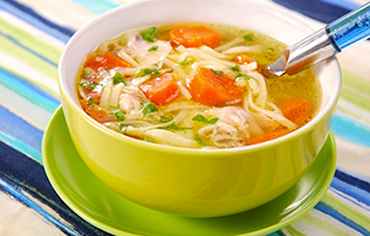 A delicious soup made with corn, chicken and vegetables. A delicious soup made of spicy and tangy combination of veggies, chicken and Chinese sauces. Steamed rice cakes served with lentil soup (sambar) and 2 chutneys. Steamed rice cakes dipped in lentil soup (sambar). Fried lentil patties served with lentil soup (sambar) and 2 chutneys. Fried lentil patties dipped in lentil soup (sambar). Fried lentil patties dipped in tasty yogurt. 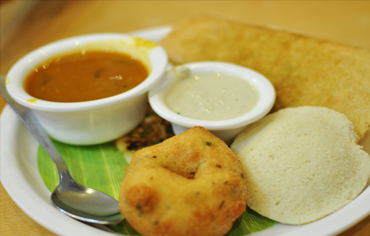 A combination of steamed rice cakes and fried lentil patty, served with lentil soup (sambar) and 2 chutneys. 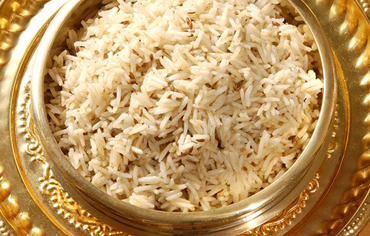 A south indian delicacy made with cracked rice. 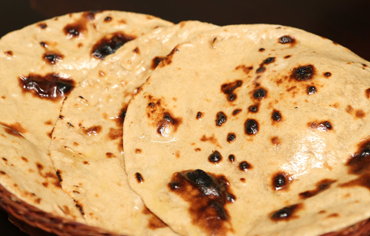 A delicious karnataka recipe made with rice, spices and lentils served with papad. A plain rice crepe, served with lentil soup (sambar) and 2 chutneys. A plain lentil & rice crepe stuffed with onions, served with lentil soup (sambar) and 2 chutneys. A plain lentil & rice crepe stuffed with potato masala, served with lentil soup (sambar) and 2 chutneys. Lentil & rice crepe stuffed with red chutney, potato masala, served with lentil soup (sambar) and 2 chutneys. Lentil and rice crepe stuffed with mysore chutney, onions, tomato, cheese and potato Masala, served with lentil soup (sambar) and 2 chutneys. Lentil and rice crepe stuffed with spicy chutney and potato masala, served with lentil soup (sambar) and 2 chutneys. Lentil and rice crepe stuffed with schezwan paneer, served with lentil soup (sambar) and 2 chutneys. Lentil and rice crepe stuffed with gobi masala, served with lentil soup (sambar) and 2 chutneys. Lentil & rice crepe stuffed with chana dal powder, potato, masala, served with lentil soup (sambar) and 2 chutneys. Lentil and rice crepe stuffed with roasted garlic, potato masala, served with lentil soup (sambar) and 2 chutneys. Lentil & rice crepe stuffed with coriander chutney, potato masala, served with lentil soup (sambar) and 2 chutneys. Lentil & rice crepe stuffed with paneer manchurian, served with lentil soup (sambar) and 2 chutneys. Lentil & rice crepe stuffed with red chutney, paneer, potato masala, served with lentil soup (sambar) and 2 chutneys. 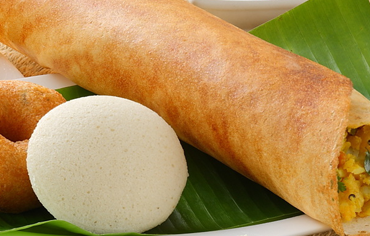 Large plain rice crepe, served with lentil soup (sambar) and 2 chutneys. Lentil and rice crepe stuffed with sauteed chinese vegetables, served with lentil soup (sambar) and 2 chutneys. Green lentil and rice crepe served with lentil soup (sambar) and 2 chutneys. Green lentil & rice crepe stuffed with upma, served , with lentil soup (sambar) and 2 chutneys. Green lentil & rice crepe stuffed with upma, served with lentil soup (sambar) and 2 chutneys. Green lentil & rice crepe stuffed with potato masala served with lentil soup (Sambar) and 2 chutneys. Crepe made with cream of wheat and rice batter, served with lentil soup (sambar) and 2 chutneys. Crepe made from cream of wheat and rice flour and stuffed with onions, served with lentil soup (sambar) and 2 chutneys. Crepe made from cream of wheat and rice flour and stuffed with tomatoes, served with lentil soup (sambar) and 2 chutneys. Crepe made from cream of wheat and rice flour and stuffed with potato masala served with lentil soup (Sambar) and 2 chutneys. Crepe made from cream of wheat and rice flour and stuffed with nuts and raisins, served with lentil soup (sambar) and 2 chutneys. Thick Crepe of lentil & rice stuffed with vegetables, served with lentil soup (sambar) and 2 chutneys. Thick crepe of lentil & rice stuffed with onions, servedwith lentil soup (sambar) and 2 chutneys. Thick crepe of lentil & rice stuffed with onions and chillies, served with lentil soup (sambar) and 2 chutneys. Thick crepe of lentil & rice stuffed with tomatoes, served with lentil soup (sambar) and 2 chutneys. Thick crepe of lentil & rice stuffed with paneer, served with lentil soup (sambar) and 2 chutneys. Different types of uthappams served with lentil soup (sambar) and 2 chutneys. Tilapia fish cooked with house made tamarind and peanut based sauce and spice – An Andhra delicacy. Tilapia fish cooked with delicious creamy gravy and flavorful spices. Shrimp cooked in peppers, onion, spices and house made tomato based sauce. 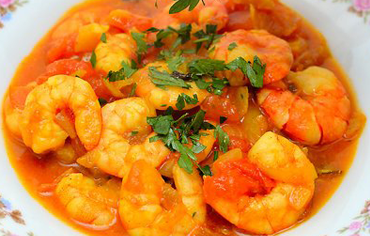 Shrimp cooked with delicious creamy gravy and flavorful spices. A delicious combination of shrimp marinated in vinegar, hot pepper, potatoes & spices cooked in house made vindaloo sauce. Shrimp slow cooked with house made sauce, tomato, and spices - An Andhra delicacy. A delicious gravy cooked with shrimp, spinach, cream and flavorful spices. 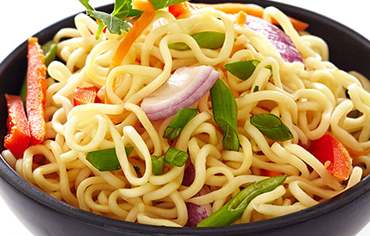 Mildly spiced noodles with vegetables. 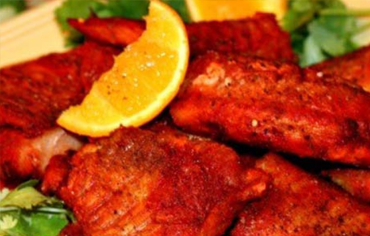 Tender chicken pieces breaded and fried. 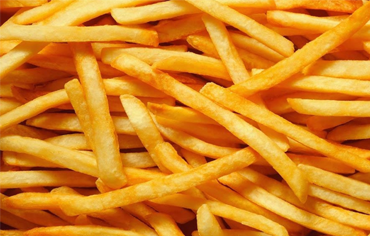 Sliced potatoes fried in mild spices. A triangular pastry stuffed with potatoes & peas deep fried. 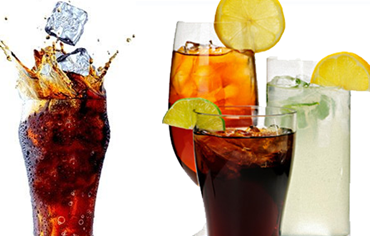 Served with fresh mint and tamarind chutney. Sliced potatoes coated with spicy chickpea flour batter deep fried. Served with fresh mint and tamarind chutney. Chillies(banana peppers) coated with spicy chickpea flour batter and deep fried, cut into half and stuffed with onion and peanut powder. Stuffed, batter covered long hot peppers are deep fried and then cut into pieces, served with fresh mint and tamarind chutney. Vegetable & cashew dumplings stir fried with peppers, onions and house made Manchurian sauce. 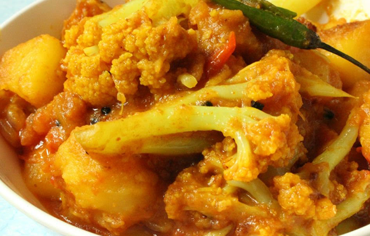 Fried cauliflower florets stir fried with peppers, onions and house made manchurian sauce. Sliced onions coated with chickpea and rice flour batter deep fried, served with fresh mint and tamarind chutney. Spinach mixed in chickpea and rice flour batter, deep fried, served with fresh mint and tamarind chutney. Variety of vegetables dipped in a spicy chickpea flour and deep fried, served with fresh mint and tamarind chutney. 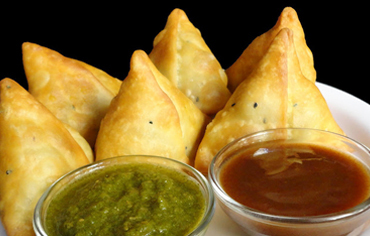 Samosa mixed with chickpea masala, chat powder and topped with mint sauce, tamarind sauce, yogurt and onions. Fried paneer pieces stir fried with peppers, onions and house made chilli sauce. Fried rice cakes stir fried with peppers, onions and house made chilli sauce. Fried cauliflower florets tossed with onions, garlic, and house made sauce and spices. Boiled egg slices dipped in a spicy chickpea batter and deep fried, served with fresh mint and tamarind chutney. 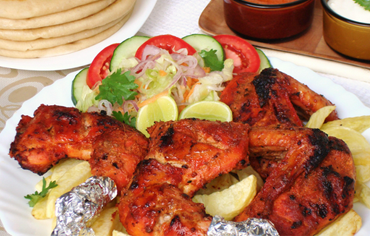 Boneless chicken pieces marinated with yogurt, spicy masala and deep fried. Fried boneless chicken pieces stir fried garlic, green chilli and house made chilli sauce. Fried boneless chicken (cut into thin long pieces) stir fried with chopped garlic, green chilli, cashew and the spices. Fried boneless chicken stir fried with ginger, garlic, lime juice and the spices. Shrimp marinated with yogurt, spicy masala and deep fried. Shrimp stir fried with garlic, green chilli and house made chilli sauce. Fried boneless chicken pieces stir fried with crushed black pepper and house made sauce. Chicken wings marinated with house made batter and deep fried. Fried boneless chicken stir fried with peppers, onions and house made manchuria sauce. Fried boneless chicken tossed with dry red chillies and house made schezwan sauce. Cauliflower florets and potatoes, green peas cooked with house made sauce and spices. Potatoes, green peas cooked with house made sauce, spices and cream. Lightly spiced okra cooked with house made tomato sauce and spices. Assorted vegetables cooked with house made sauce, spices and cream. Chickpeas simmered in house made sauce, spices. Slow simmered lentils and kidney beans with butter, fresh garlic, ginger, tomatoes and cream. Yellow lentils cooked and tempered with seasoning. Spinach and lentils cooked and tempered with seasoning. Rolls of cottage cheese and Mashed Potato, fried and simmered in house made sauce, spices and cream. A delicious creamy gravy with green peas, cottage cheese cubes and spices. A delicious creamy gravy with fenugreek leaves, green peas and spices. A delicious creamy gravy cooked with cottage cheese cubes with flavorful spices. A simmered spinach gravy with cottage cheese cubes, cream and flavourful spices. A delicious house made tomato sauce cooked with cottage cheese cubes, makhani (butter), spices and cream. Assorted vegetables cooked with house made sauce, spices, fruits, cottage cheese cubes and cream. Indian hot peppers and spices cooked in tasty peanut and tamarind sauce. Baked eggplant, tomato cooked in house made sauce. Eggplant and spices cooked in tasty peanut, sesame and tamarind sauce. Assorted vegetables cooked with spicy tomato based gravy in a dry form. Boiled eggs cooked in house made sauce with tomato. Boneless chicken cooked with spicy curry sauce. Boneless chicken cooked in spicy chettinad sauce. 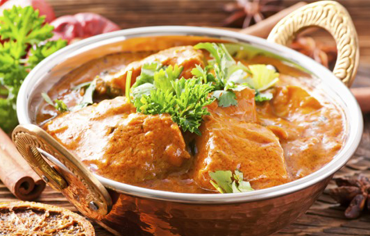 A delicious creamy gravy cooked with boneless chicken cube tikka pieces and flavorful spices. Boneless chicken cooked with peppers, onion in tomato based house made sauce. A delicious house made tomato sauce cooked with boneless check shredded tikka pieces, makhani (butter), spices and cream. Boneless chicken cooked with Egg White, mild spices in thick and creamy gravy. A delicious combination of boneless chicken marinated in vinegar, hot pepper, potatoes & spices cooked in house made vindaloo sauce. Boneless chicken and assorted vegetables cooked with spicy tomato based sauce. Boneless chicken cooked with house made sauce, spices and cream. Bone-In pieces of chicken slow cooked with onions, and spices - An Andhra delicacy. Boneless lamb cooked with house made sauce, spices and cream. A delicious house made tomato sauce cooked with boneless lamb cubes, makhani (butter), spices and cream. A delicious gravy cooked with boneless lamb, spinach, cream and flavorful spices. Boneless lamb cooked with masala in a hearty blend of tangy tomatoes, green peas, aromatic herbs and spices. Boneless lamb cooked in peppers, onion, spices and house made tomato based sauce. Boned chicken cooked with Special house made Spices. Bone-In chicken cooked with house made special sauce. Bone-In goat cooked with special house made spices. Bone-In goat cooked with Andhra special house made sauce and spices. Boneless lamb cooked in house made tomato based sauce. Chicken marinated with yogurt, mild spices and cooked in clay oven. Cubes of chicken breast marinated in yogurt, mild spices and cooked in clay oven. Minced lamb marinated with yogurt, mild spices and cooked in clay oven. Shrimp marinated with yogurt, mild spices cooked in clay oven. Mixed vegetables marinated with house made sauce and spices cooked with basmati rice on a low heat. 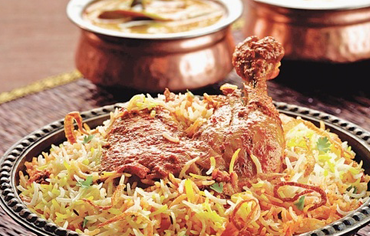 Bone-In chicken marinated with house made flavored spices, cooked with basmati rice on a low heat. Cubical chicken tikka pieces flavored with house made sauce & spices cooked with basmati rice. Marinated boneless chicken thigh cooked in house made sauce and basmati rice. Boneless lamb marinated and cooked with home made sauce and cooked with basmati rice on a low heat. Marinated boneless chicken thigh cooked in house made sauce, basmati rice, cashew nuts and boiled egg pieces. A bread made with all purpose flour, deep fried and served with chickpea masala. All purpose flour bread baked in the clay oven. All purpose flour bread baked in the clay oven and spread with butter. All purpose flour bread with fresh Garlic and baked in the clay oven. All purpose flour bread stuffed with coconut, raisin, cashews, almonds and baked in the clay oven. A bread made with wheat flour in layered form and baked in the clay oven. Whole wheat bread stuffed with potatoes and baked in the clay oven. Whole wheat bread stuffed with cauliflower and baked in the clay oven. Whole wheat bread stuffed with paneer and baked in the clay oven. All purpose flour bread stuffed with onions and baked in the clay oven. Vegetable & cashew dumplings sautéed to delicacy and served in house made manchurian sauce. Egg plant fried with spices and served with garlic sauce. A popular Indian dessert, Rice Pudding. Deep fried roundels of cottage cheese and flour soaked in a Saffron flavored sugar syrup. 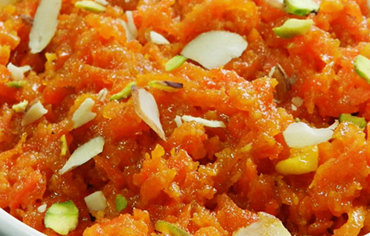 A popular Indian dessert, made with fresh carrots, milk, sugar, ghee and topped with nuts and raisins. Traditional Indian ice cream flavored with pistachio. Fruits mixed with mango Pulp and milk. Indian coffee made with milk. RHouse made buttermilk with sweet flavor. House made buttermilk with salt flavor. House made buttermilk flavored with mango pulp. House made shake with milk and Mango ice cream. House made rose flavored milk. Made with rose syrup, basil seeds, dry fruits, milk and topped with Ice Cream.